Armed only with a sword, you must first defeat the outpost guards. Then, enter the Underworld. Here you activate the awesome Nova Suit. A secret force left to you by your fallen father, you are half man, half mechanical monster. Nearly invincible, your sword cracks with the power of lightning, as you wreak havoc on the fearsome Dudes. Your goal is to reach the Robo Zone (the seventh Alpha Zone), headquarters of B.A.D. Succeed here and you will have won the game, recapturing the Earth and restoring humanity's place in the universe. You will have help along the way. Four friends offer you advice, swords, bombs and extra lives. Collect the stolen riches left behind by the invaders and buy your way out of trouble with money." 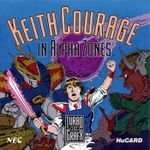 "Keith Courage in Alpha Zones is a game by Hudson Soft for the TurboGrafx-16, and was included in the box with the North American version of the system. The game was originally released in Japan on August 30, 1988 for the PC Engine (The TG-16's Japanese counterpart), under the title Mashin Eiyūden Wataru (魔神英雄伝ワタル), which is adapted from the anime television series of the same name (Spirit Hero Wataru)."" Source: Wikipedia, "Keith_Courage," available under the CC-BY-SA License.